Our holiday travels took us away from the Bronx-Westchester Christmas Bird Count, so we decided to do a bit of avian enumeration of our own. The one bird I’ve been eager to count is the Ruffed Grouse, a species so common here in northern Pennsylvania that locals frequently trip over grouse in full display, at least when they’re not shooting the birds. I have no interest, of course, in gunning down my quarry; my safaris are peaceful, photographic affairs. Seth and I went searching for grouse to no avail last December. This year, armed with twelve more tremendous months of birding experience, I was hopeful of success. On Christmas Eve, Will led us out to a spot where he had flushed a sluggish American Woodcock just a few days previously. We ventured deep into remote woods, even crossing a rushing, frigid stream in the quest to find our target birds. All we got for our trouble was a lonesome Golden-crowned Kinglet and frozen feet. Two days ago, Seth and I took a different tack, stalking an unplowed country road to pull various winter species. American Crow, White-breasted Nuthatch, Dark-eyed Junco, American Tree Sparrow, and the ubiquitous Black-capped Chickadee were our only companions as a freezing rain fell. Since that tactic proved less than fruitful, we decided to cover more ground by driving around. The grouse still eluded us. We did encounter a variety of raptors though. The Red-tailed Hawk was fully expected and the Cooper’s Hawk was not entirely unexpected, but the Rough-legged Hawk hunting a snow-covered field was a complete surprise. This was only my second view of a rough-leg, Seth’s first. Spotting it amidst the trees really drives home how huge this bird is. I struck out on my own yesterday. He who travels light gets the worm, right? Well, I didn’t. Out there among the stark, stabbing skeletons of hawthorns in winter, I found peace and quiet, but no grouse. 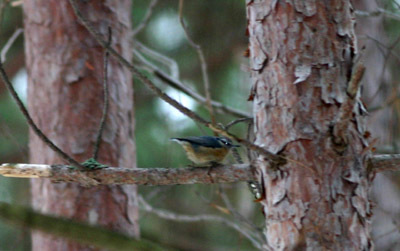 I had to content myself with the raucous honk of a Common Raven, an American Robin too lazy or hardy to migrate south, and a peppy flock of Red-breasted Nuthatch. And, of course, more frozen feet. Yet, I remain undeterred. The window for spotting one of these birds on this trip may be closing, but I’ll be out at least once more grousing around. Where Are You Birding this Third Weekend of June 2009?